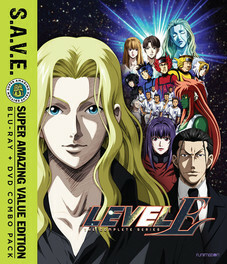 Level E The Complete Series contains episodes 1-13. This extraterrestrial adventure follows the alien genius, Prince Baka as he turns life on Earth into his own personal laugh track. The Prince has the biggest brain in the galaxy, and he's also a sadistic prankster who loves to make humans squirm. Anime fans will fall hard for this nostalgic, undeniably clever series that spoofs the television shows, video games, and superheroes they loved as kids. You'll laugh, you'll cry, you'll remember that thing you did that was super mean , but also super hilarious. So yeah, Level E the alien invasion has begun. Prepare to die...laughing! Special Features: Japanese Live Action promo video, Voice actor commentary for 2 episodes, Cast interview.